There are quite a few different types of fish that I pursue while on the Chesapeake Bay. On this page, I will discuss some of these Chesapeake Bay fish species in detail. Needless to say, striped bass get their name from those long, dark stripes along their bodies. Around here, they are more commonly known as rockfish. These fish can be found anywhere along the Atlantic seaboard, from Canada all the way down to the Gulf of Mexico. One neat thing about these fish is that they can be found in both freshwater and saltwater environments. This can't be said about most types of fish. In the early part of the year, striped bass migrate up the Chesapeake Bay and into the bay's many tributaries. There, they spawn when the water temperature gets high enough. Then, they migrate back out into the ocean. These are the BIG fish like the one that can be seen in the above picture. 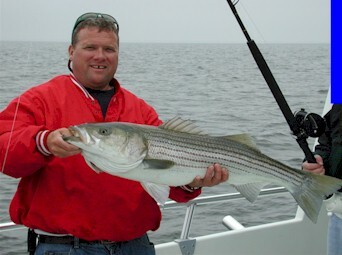 We troll for these big Chesapeake Bay striped bass in late April and early May. In Maryland for 2016, you are allowed to keep up to one rockfish per person, as long as the fish are at least 35 inches in length. Then, in the fall season of the year (late November - early December), these rockfish come back into the bay, in search of bait fish known as menhaden. When they do this, we usually have a pretty decent fall season. The big ones are usually gone from the bay during the summer months, but there are plenty of resident fish around that never leave the Chesapeake Bay. These fish are usually anywhere from 18 to 28 inches long, and we usually either troll for them or fish with live bait in a technique that's known as live-lining. In Maryland for 2016, you are allowed two fish per person that are at least 20 inches long. Of these fish, only one per person can be over 28 inches. This regulation only applies after May 15, as any fish under 28 inches that's caught before then must be released. These bluefish that you see here can usually be found in the Chesapeake Bay between the months of June and October. While bluefish that are caught out in the Atlantic Ocean can weigh as much as 40 pounds, most bluefish in the Chesapeake Bay range between 2 and 5 pounds. These are the perfect size for eating, as the bigger fish are very oily. The important thing to remember about bluefish is that you have to keep them iced down while on the boat, and eaten fresh, not frozen. When I fish for bluefish, I'll troll with either 4 or 6 lines that have either tube lures or spoons attached. When you go over a school of bluefish, it isn't uncommon to have several lines hook up at once. A lot of times, especially in September and October, we'll catch bluefish mixed in with the striped bass while we're fishing with live bait. In situations like this, I'll often use wire leaders on the line, as the bluefish will bite right through that monofilament line, wreaking havoc on my tackle supply. They have razor sharp teeth, so don't get bit by one! Spanish mackerel are often caught on the Chesapeake Bay during the months of August and September. I usually catch them mixed in with the bluefish while I'm trolling. This is a very fast-moving fish, so you usually have to be trolling in order to catch one. When pursuing these fish, I like to troll with spoons. Like the bluefish, they'll weigh anywhere between 2 and 5 pounds and are really good to eat. They are also one of the prettiest fish that you'll ever see. Like the other fish in the Chesapeake Bay, Spanish mackerel feed on menhaden, anchovies, and other small fish. They are carnivorous, and have very sharp teeth. Croakers are known for the croaking sound that they make when you pull them out of the water. This sound is produced by their stomach muscles beating up against their swim bladder. These fish are caught on the Chesapeake Bay between June and August. Bottom fishing is the only way to catch these fish, as the bottom of the bay is where they stay. While peeler crab and bloodworms have been used to catch croakers, squid is the most effective bait for catching these fish. They range anywhere from 9 inches to 18 inches in length. While these fish have been caught during all hours of the day, the catch is usually a lot better at night. You can be sitting there fishing for croakers all afternoon, without a bite, but as soon as the sun hits the trees, the fish will start biting if they're around, and you can catch a lot of them in a hurry.